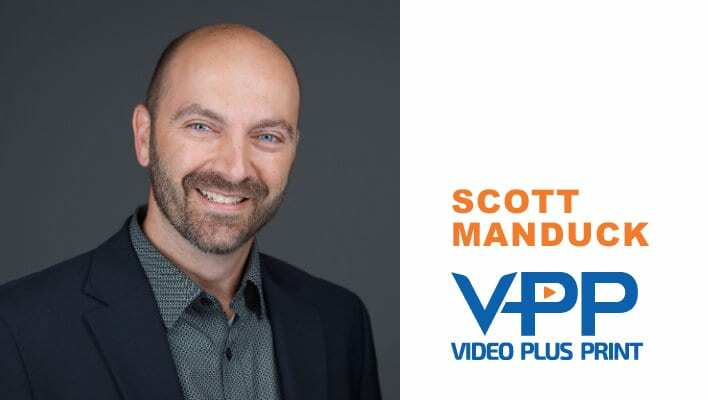 I (virtually) met Scott Manduck of Video Plus Print a year or so ago. I was exploring the prospect of using video brochures in a campaign. He noticed my interest and sent me a LinkedIn message. We kept in touch and recently I received an email from his company that included a video of a new product that combines print, video, and a hologram effect. I thought it was cool and I wanted to share it with our integrated marketing community. I gave Scott a call and he agreed to join me for the interview presented below. Andy: Thank you for agreeing to do this interview. Before we get into holograms and print, can you tell us a little about yourself and your role at Video Plus Print? 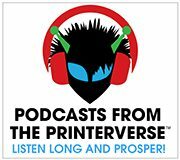 Scott: I’ve been in the printing industry for over twenty years. I have worked with many clients in Canada and across the US over the years when it comes to digital, variable print, offset and web printing. In my role, I am the North American Director and partner of Video Plus Print and I am based out of the Canadian office. Vijay Mahbubani plays the role of our Global CEO and is based out of Hong Kong office, while Hussain Manjee, who is based out of our Dallas, Texas office, plays the role of VPP USA managing partner. Video Plus Print is an Award Winning global technology partner and manufacturer of Video Brochures, Video Books, Video Business Cards, Custom Video Packaging, Multi-sensory Products, Solar Vibration, In Store Displays, Wi-Fi Video Books, Phone in Print (Ring-a-Print), 360-degree Video Brochures, Hologram Video Brochures and a Full Video Production & Motion Graphics team (in our Dallas office). 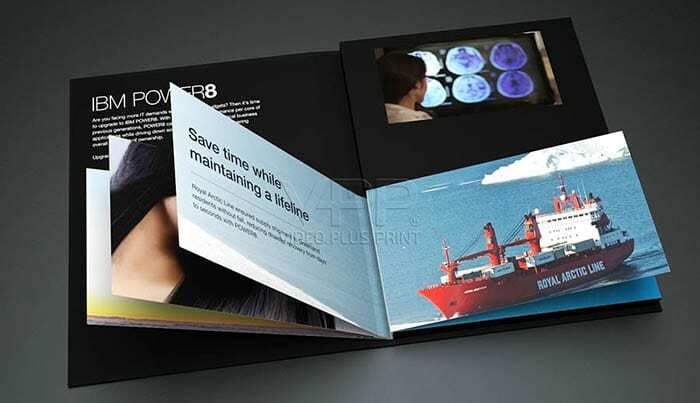 A great example of multi-sensory in print at its best is an order we did for IBM. Video Plus Print came up with this concept that will have a min brochure down the bottom and while you turn each page the video above will change at the same time. This makes this book super engaging as it creates an interaction with the user experience that is unforgettable. Another eye catching campaign we worked on was for the new LAFC stadium being built. This was a beyond high profile project and turned out to be a huge success with the LAFC management team. 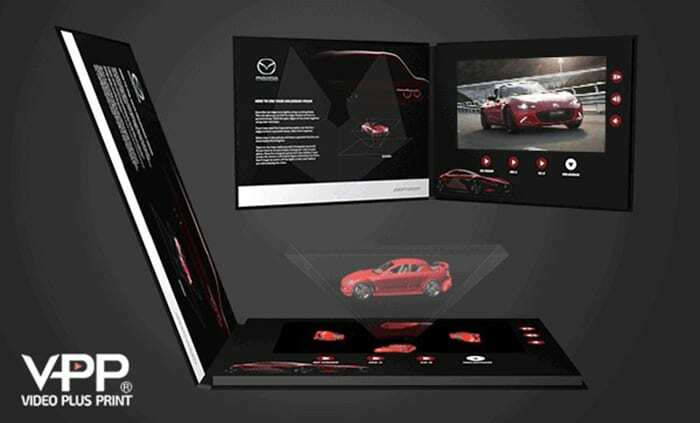 Most people go crazy over a standard video brochure as it is still only 7 years young in the industry, but now when you add a very old school pyramid (hologram effect) with our video brochure it brings the excitement and engagement to a whole new level. You should keep in mind that this is a reflection of 4 videos into the pyramid which gives the effect of the hologram. You can do some pretty cool and amazing things with video these days that is for sure. Andy: The video definitely caught my attention. Can you tell me a little bit about what we’re seeing in the video? How does this work, for anyone unfamiliar with this technology? Scott: Hologram has been around for a very long time as we know and there are a few forms of hologram in the movie industry. What we have is a hologram prism or a pyramid cone we place in the middle of our 7” or 10” HD screen, which reflects the video that has been split into 4 sections of the screen. If you take a piece of paper, and draw a big cross on it, you’ll have a video in the top left corner, the top right corner, bottom right corner, bottom left corner, and when you put the cone in the middle of this, the cone is going to take all four of those videos and give you a three-dimensional hologram of that video in the middle of the prism. Andy: How could the technology be used? What are some of the applications? Scott: When people get one of our Video Plus Print products, and it could be as simple as an 8.5”x 5.5” size brochure with a 7” LCD video screen in side, they think it is just a typical printed brochure. But, they feel a little bit of weight to it and realize it’s not the standard weight of a brochure. They open the front cover and the video automatically starts to play. They are beyond blown away that someone has sent them or gave them a custom printed brochure and it has an LCD screen built into it. One of our clients sent out 500 video brochures, and I did our typical follow up to see how things were going and the response kind of blew me away to be honest. The customer’s response was mind blowing as they were hearing from people that had nothing to do with the list they sent these 500 video brochures out to. It took me a minute to figure out that many of the people were sharing the video brochure with other people they know in the industry and they were following up. So, if you think about it, the ROI on 500 brochures is not based on 500 its much larger than that, and now people are saying 6-8 people are seeing the brochure. So, you can bet that on a 500 pieces’ deployment you will have over 3,000 people engaged in your product or company video brochure. This is a huge statement as you will NEVER get a response like this with any kind of typical printed product. It’s working well for our customers and the repeat orders are growing every month and year. The customer may order 100, then a few months later it will grow to 500, then they’ll order 1000. A repeat order is the best compliment we can get as this shows the product is working and they are making more money with them. Andy: Let’s talk about the future. Where is the technology going? What should marketers have on their radar for 2017 and beyond? Scott: The technology is changing so quickly. We have lots of tech that people don’t even know is available yet like 360 video in print. 360 video is probably the fastest growing thing; you just go to YouTube and type in “360 video” the first video you’ll see is a 360 video someone recorded on a roller coaster ride. So, imagine a video brochure, where you can scroll with your finger, just like on an iPhone, and you’re pushing from left to right and right to left, you’ll be zooming around with the video and you can see your face reactions or you can even pretend you are going down the rollercoaster again. 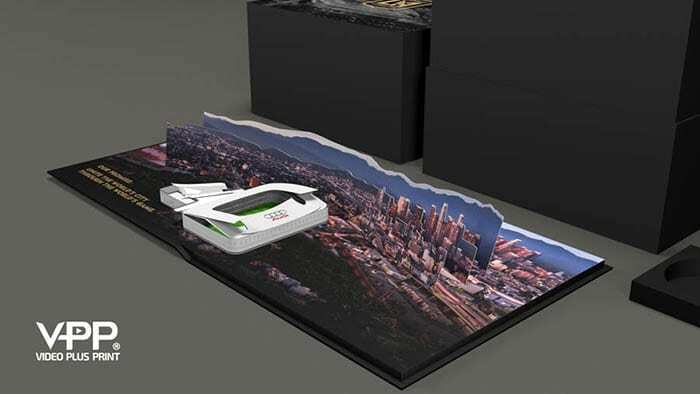 Andy: 360 video on a printed piece? Wow. Scott: That is the typical response which gets me all excited as that means our product is working. Imagine what your customer would say when they get something like this! Scott: This is the sort of stuff and conversations that keeps on pushing us and pushing different technology and presenting new ideas and concepts to our customers. Scott: Do you read magazines, what kind of magazines? Andy: Of course, I read magazines. Let’s see, I read Ebony, oh and Wired. Scott: Wired that’s a good example – because it has so much technology in it. Picture a publication that goes out and it has sponsors: Samsung, Sony, Panasonic, etc. We add an LCD video screen right into the magazine which is also safe to mail across North America. How cool would it be to get a magazine with an LCD screen in the middle of it and it is plays a commercial of any brand you want in addition to editorial content that narrates a story in written text and video? Print is changing; it’s not dead. Andy: What’s the best way for people to learn more about what you do and how you can help them? Scott: You can email me directly scott@videoplusprint.com or my direct line 647-402-9025. You can also check out our website: www.videoplusprint.com or call our Dallas Office at 214-932-4030. And please be sure to connect with me on LinkedIn. Read the FULL interview (yes there is more!) here. Due to language constraints, in Vietnam I find it difficult to access new knowledge. The printing industry as well as our design is very limited. Having access to or exchanging knowledge from abroad will help us have enormous resources to grow. I know a lot of businesses in Vietnam are doing business in printing as we need this information. Following your blog for a long time, I am very thankful for the information you share. Hope you will continue to bring useful knowledge and information to the community. HOW COOL!!! If I can help you get info in any way, please let me know!